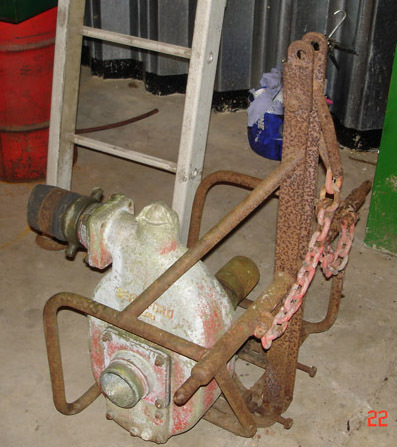 Recently, the decision was taken to part with some of the rarer Ferguson Implements, and those requiring significant restoration work, in order to make way for implements which are in better condition. Detailed below are some of the more recent sales. 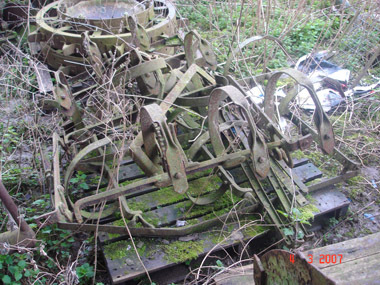 These harrows were found under a hedge in a Suffolk hauliers yard. 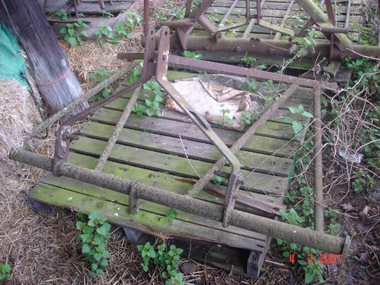 Although relatively sheltered from the hedge, the main frame had rusted quite badly (common fault on these implements) and proceeded to collapse when it was unloaded. This repair will be quite easy to carry out, however, the more concerning problem is that the edge pieces of each gang is fairly badly rusted and would require significant patching. 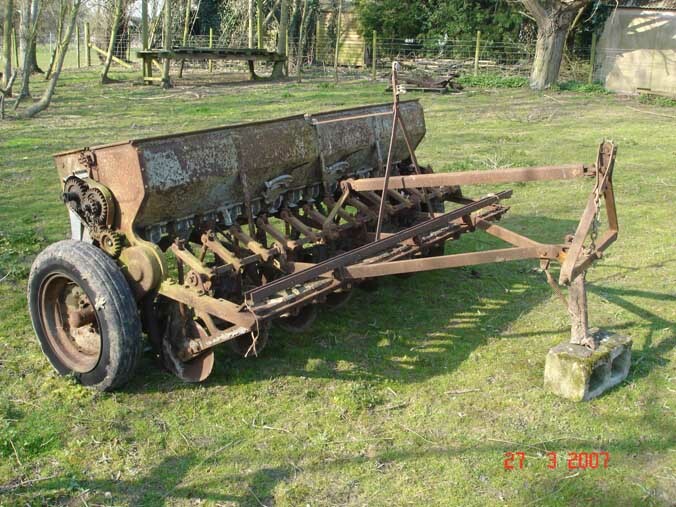 These harrows are unusual in that they are a 3 gang model with the earlier Massey-Harris style headstock (I have not seen another example of these). The main frame, which is usually a problem with these, is in very good condition but one of the gangs requires completely rebuilding. These have now been passed on to join a larger collection for full restoration. These discs came from the Fens where they had occasionally been used, but had not been well looked after resulting in some of the discs needing replacing and bars straightening. I had not had a chance to start work on these since I purchased them (over 3 years ago) and recently the decision was made to part with them; they are now with a large Ferguson collection in Gloucestershire. 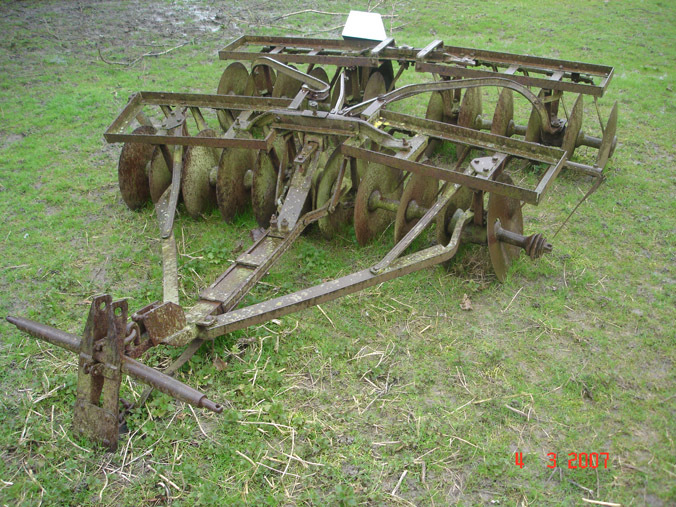 This incredibly rare implement was found in the same yard as the Hammer Mill, and was in good original condition (although seized). It was decided that the pump would be better in a larger collection and has since been passed on, where it is undergoing a full restoration. This Mill was found holding up a shed roof in a run-down yard. The weather had been kept off it, resulting in it being in excellent original condition. It had previously been used behind a David-Brown for grinding pig feed (and still contained some ground meal!). 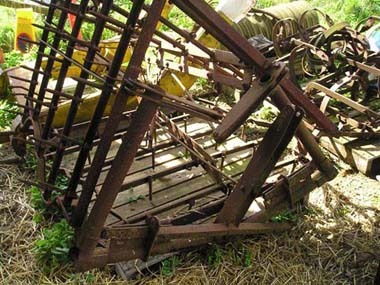 Due to having enough on-going projects, it was decided to sell this implement through the April 2006 Cheffins Vintage Auction. It is now part of a collection in Essex. My second drill was standing in an old building where I found some other Fergy bits and pieces. This shed has now been pulled down, and the drill was collected at Easter 2007, before the weather did too much damage. The drill is in good original condition, but is missing some of the delivery tubes and the feed mechanism is stuck. The fertiliser box on the other hand is in outstanding original condition. This is now part of a collection in Essex. The purchase of a Ferguson Mower during 2004 led me to be offered this 703 baler from the same person in Aberdulais, South Wales. I agreed the purchase some time before collection, and unfortunately the baler, sitting outside in a wood, deteriorated somewhat further before I could pick it up. Details of the collection of the baler can be viewed here. Since its purchase I have stored it under cover, but have done very little with it; the plunger is currently seized, as are the knotters (spares were collected from Chepstow on the way back to Suffolk) and the string and charge chambers require completely new metal. This has now been passed on to a fellow collector who plans to use it to make a 1/3 scale model.